Introduction to Selenium WebDriver, Advantages of Selenium WebDriver, Drawbacks of Selenium WebDriver, Writing Test Steps in Selenium WebDriver using Element Locators and WebDriver API Commands. Selenium WebDriver Environment Setup and write first Selenium Test Case. > In 2006 Selenium WebDriver was launched at Google. Note: Now Selenium RC is only for maintenance projects. > It has Programming interface only, no IDE. > Selenium WebDriver supports Data driven Testing and Cross browser testing. > Selenium WebDriver is faster than other tools of Selenium suite. > Selenium WebDriver supports Parallel test execution with the help of either JUnit or TestNG. > No Built-in Result reporting facility. > No other tool Integration for Test management. > No centralized maintenance of Elements/objects. Using Objects information and Test Methods we create Tests. Using Element Locators and Webdriver Commands/methods we create Test Cases. Element Locators – to recognize elements/identify elements. WebDriver commands/methods – to perform operations on elements. TestNG Framework – for grouping Test cases, batch Testing and generating Test Reports. 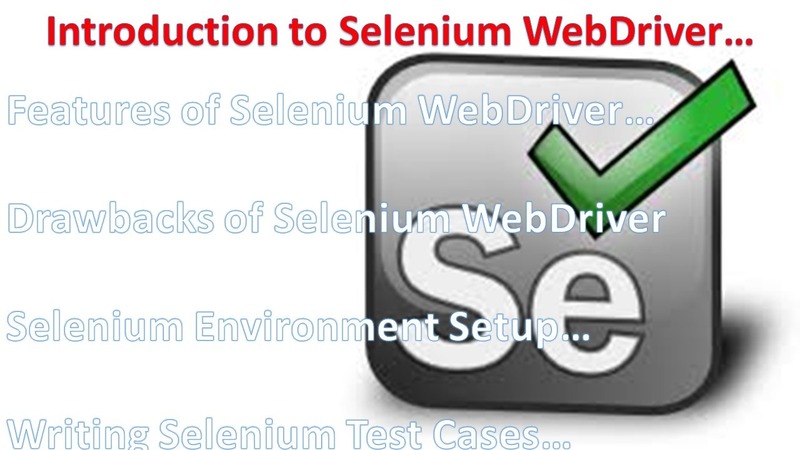 ii) Selenium WebDriver Environment Setup. 2) Set Environment variable (path variable). 3) Download Eclipse IDE and extract – to write and execute Java programs. 4) Download Webdriver Java language binding (www.seleniumhq.org) and add WebDriver jar files to Java project in Eclipse IDE. 5) Install Firebug and Firepath plug ins (Mozilla Firefox) for inspecting elements. built in developer tools(F12) for inspecting elements. 7) Firefox driver is default driver in Seelenium Webdriver, for IE and Chrome etc… Browsers then we need to download browser drivers. Download Selenium WebDriver Java language binding from www.seleniumhq.org website and extract. > Browse path of the WebDriver jars. > Using Element locators and Webdriver commands write test steps. > Insert java programming statements to enhance Test cases. > Using TestNG Annotations group test cases, execute test batches and generate detailed test reports. * Verification point: Capture the Browser URL after submission of Login details and compare with expected URL.